The Arabic “shawarma” comes from the Turkish word çevirme and it means “turning”. It expresses the way of preparing the food – you need to cook the meat on the grill and turn it. In Arabic coutries people go out to eat shawarma. It is kind of a fast food there (from my observations). We prepared it in a different way – this beef is cooked in a pressure cooker. We were also very careful with spices – to make sure our european stomach will survive this mix of different flavours. 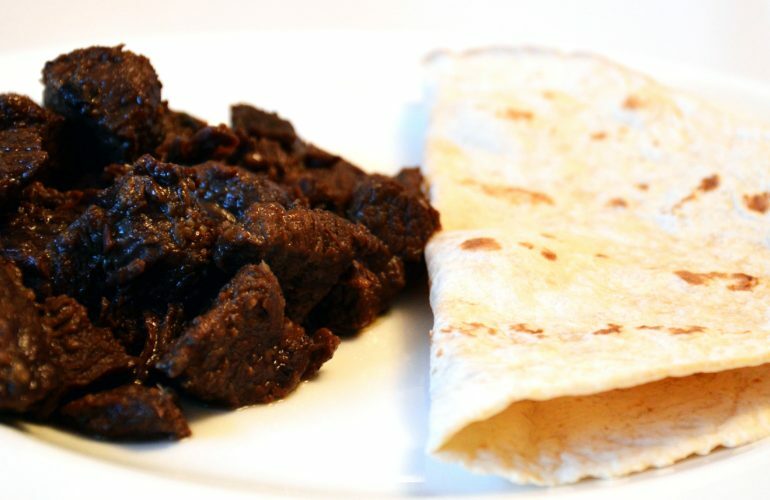 Here is the recipe which we took as a base : Beef Shawarma made at home. The first time I have eaten shawarma on our holiday in Dubai in 2014. That was in one of the restaurants in Dubai Mall. We sat outside and we had amazying view to the fountain and water garden. In Dubai you can eat food from all around the world – but we have decided to stick to arabic food this night. Shawarma that we made is a little different, because it was made at home. How to prepare beef shawarma? 1. Mix all the spices with lemon juice and vinegar. 2. Wash and cut the beef into stripes. 3. Place meat cuts in the marinade, add oilve oil and mix all ingredients together. Leave it over night. 4. Cook the meat in a pressure cooker for at least 30 minutes. 5. Serve with pita bread, french frites, grilled tomatoes or tahini sauce.